Ok, I wasn't supposed to bake muffins ALSO this weekend, I swear it. It wasn't planned. 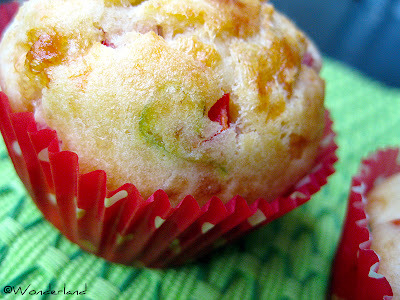 These muffins were reeeeeeeeeeeally good. I love bell pepper so I tend to use it in many of my dishes, and the same goes for zucchini. You can use vegetables and cheese of your choice too, for example smoky flavored cheese or cheddar, they would taste great. 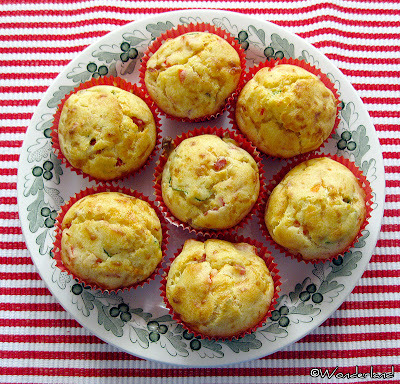 These muffins are surprisingly light, so you can enjoy them for breakfast, as snack or even serve them with a soup. HINT: I fried for few minutes the sliced zucchini on a nonstick pan without oil or butter, so they'd release most of their water. You can do the same with the bell pepper too if you want. Wash and slice zucchini and the bell pepper in small pieces. Fry for few minutes the zucchini on a nonstick pan at vivid flame without oil or butter, so they release most of their water. Let it cool down. Preheat the oven at 200º C (392º F). In a bowl combine the dry ingredients: flour, salt and baking powder. Make a small hole in the middle. Add all the wet ingredients to the mixture: egg, ham, cheese, veggies, oil, milk. Sprinkle with a bit of black pepper and oregano. Spoon the mixture into prepared muffin cups, filling about 2/3 full. Bake at 200º C (392º F) for 15-20 minutes or until muffin tops just begin to brown. 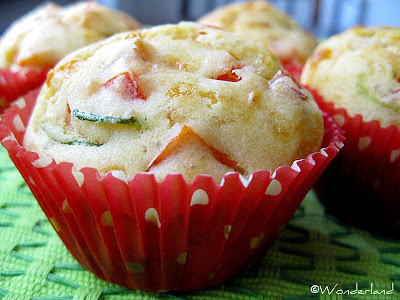 As usual, check if they are ready inserting a toothpick in the middle, if it comes out clean, then the muffins are cooked. Remove from the oven and let them cool down before devouring them.